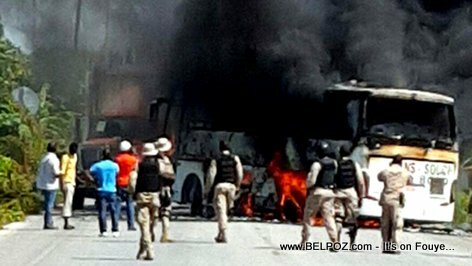 KREYOL: Haiti - Tension nan ville ARCAHAIE... Zèfèyis mete yon trailer an kwa sou wout la epi yo ba li DIFE... Yon trailer ki vann 95 mill dola US dapre yon jounalis... Kisa ou panse de sa??? According to news reports, some groups in Arcahaie are attempting to foil the plan for the annual Haitian Flag day cerebration that takes place in the city. Late Saturday night to early morning Sunday, roads were blocked and tires were burning in Arcahaie according to a local journalist reporting on a Port-au-Prince radio station.